(September 02, Colombo, Sri Lanka Guardian) The Sri Lanka Freedom Party was inaugurated on or about September 2, 1951, at a meeting held at the Colombo Town Hall. Mr. S.W.R.D. Bandaranaike, the leader of the party, in his inauguration speech, said: “I venture to think that this is an occasion of some importance in the political history of our country. After the party was formed, what is the contribution it made to the political life of this country? The Marxist parties constituted the main Opposition to the Government of the time, the UNP. The SLFP for the first time provided a viable democratic Opposition to the Government in power. This was more evident after the 1952 general election, in which the party was defeated, but fared well for a party that was in its infancy. For a Westminster style Government introduced by the Soulbury Constitution, which replaced the Committee System of the Donoughmore Constitution, a viable alternative Government was necessary. This political void was fulfilled by the SLFP. The SLFP participated in the struggles of the Trade Union movement of that time, but its main support base came from the rural people. The SLFP at that time was of the view that the newly-won freedom was not meaningful and that the people, especially the rural masses were not benefiting from the newly-won freedom. They gave the impression that a set of Brown Sahibs had replaced the white rulers of colonial times, by the conduct of the UNP Government. 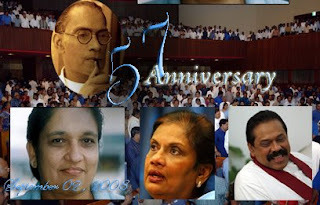 If the SLFP was to be remembered when history was written and assessed, it would be remembered for the victory of 1956. Many factors may have contributed to this victory, but it brought about a great change in the political life of the country. This was a watershed, as old rulers like Disawas and Mudliyars were deposed at the polls in 1956 and a new class close to the people like Buddhist priests, Ayurvedic physicians and Teachers started wielding influence in Government. The National dress was proudly worn by the 1956 Cabinet; honours given by the Queen were abolished and a Government that was close to the people was established. Buddhism was fostered by the State and Buddhist Pirivenas like Vidyodaya and Vidyalankara, were given the status of Universities. Greater democratization led to the General Election of one day and the earlier system of staggered polls was given up. The first one-day national poll was held in March, 1960. The July 1960 general election paved the way for the SLFP to create history when Mrs. Sirimavo Bandaranaike become the world’s first woman Prime Minister. The SLFP was able to bring about many changes in the county at that time, especially in the areas of social change together with the nationalization of key sections of the economy. Many attempts were made to bring the SLFP to unite with the UNP, but this was resisted by Mrs. Bandaranaike, as this would lead to an erosion of its base among the people. The SLFP’s main support base was on the basis of its anti-UNP political stand and its alliance with the Left parties. The bad defeat of the party in the 1977 General Election led to a long period in Opposition. During this period, many measures were taken to weaken the party and destroy it: its leader Sirimavo Bandaranaike was deprived of her civic rights; party activists were attacked, their houses were burned and some were killed, and many thrown out of employment. However, the party withstood this onslaught. The electoral changes that were brought about, were to keep the SLFP out of power. The Presidential system of Government, by which the whole country became one electorate, was also introduced to keep the SLFP out of power. The introduction of proportional representation together with bonus seat, was also a device to weaken the SLFP. This was based on the theory that the UNP got more votes, but less seats under the Westminster model. The SLFP faced these challenges and produced an Executive President with minority support and ended many years of UNP rule. The SLFP is a party that has survived for 50 years and over, providing the voters with a Government that is people-oriented and an Opposition that is democratic.